The Fine Gael councillor apologised ‘unreservedly’ for his controversial remarks on race. Leader Enda Kenny TD with school children in Kill National School in Kill County Kildare, on day two of the General Election 07. Left to right. 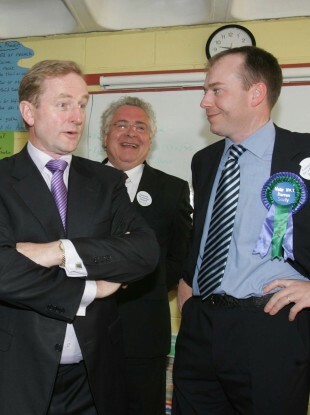 Enda Kenny, and North Kildare candidates Bernard Durkan TD and Cllr Darren Scully. DARREN SCULLY HAS resigned as Mayor of Naas following his controversial remarks on race. In a statement, the Fine Gael councillor said that he wished to apologise “unreservedly” for his remarks. “I realise they have caused deep hurt and offence in all communities and in all sectors of society. “I realise now that my remarks were open to an interpretation that I did not intend. I abhor racism in all its forms. “I have been proud to be Mayor of Naas and to represent all the people of the town. However, as a result of the upset that I have caused, I feel it is appropriate that I step down from this position”. It is unclear whether Scully will also be resigning as a councillor. Fine Gael earlier distanced itself from his remarks. Earlier, the full text of an email allegedly sent by Naas Mayor Darren Scully to radio station 4FM in advance of an interview about his controversial race views has been made public. It also emerged this afternoon that over the past seven years as a councillor, Scully was involved in organising a number of Multicultural Days, which took place at Áras Cill Dara, the Kildare County Council buildings in Naas. He is also involved in organising the annual Naas family fun day. It is believed that Scully’s fellow councillors saw him as a man who worked for inclusivity in the town and they were very surprised to hear his comments. One member told TheJournal.ie: “He does an awful lot of good work in the town – like the community day in the council that involves different members of the society and the multicultural day”. Kildare County Council refused to comment on the case, saying that the opinions expressed by Mayor Scully were his personal views and not that of the council. Cllr Scully appeared on the Late Show with Niall Boylan on Classic Hits 4FM last night where he made his initial comments. Mayor Scully also questioned the terms of the Geneva Convention and how asylum seekers were able to settle here as the first safe port they landed at. During the show, Rosanna Flynn from Residents Against Racism said that Fine Gael should expel Scully immediately as “people like him are immense trouble”. But Scully said he has many non-national friends and finds it an insult to be called a racist. Following the interview, presenter Niall Boylan said he was shocked at Scully’s comments, believing they amounted to “political suicide”. He said that he could see no other option than for him to resign from his position as Mayor of Naas and county councillor in Kildare. Scully appeared on KFM Radio this morning to clarify his comments on 4FM. A special meeting of Naas Town Council has been called for this evening in light of Cllr Scully’s comments. Mayor Scully is expected to attend the meeting, which has been called by Cllr Seamie Moore to dampen any divisions that could arise out of a “misconception of support” for Cllr Scully’s comments. Cllr Moore, a former mayor of Naas, said that while the councillors did not want to “bury an axe in [Scully's] head”, the council wanted to say that they were fully behind an inclusive society in Naas. “We have a lot of things hinging on a fully inclusive society in Naas, ” said Cllr Moore. He added that Scully’s comments could alienate him from both his fellow councillors and his Fine Gael colleagues on the council. A statement is expected from Naas Town Council later this evening. Email “Darren Scully resigns as Mayor of Naas”. Feedback on “Darren Scully resigns as Mayor of Naas”.